Removal of the antique cars and flying eagles to make room for a mediocre ride. Paramount Everywhere!! I would have preferred Action Zone to be the main hub for Paramountness. They more or less threw rides themed after movies all around the park like Italian Job and Tomb Raider. Flight of Fear was a perfect example of a great ride that didn't have to be themed after a Paramount movie. Not keeping up with park theming when they were in fact a movie company- I would have loved to see them theme Rivertown, Coney Mall, and even Oktoberfest back to their former glory. Italian Job- though I was upset when they removed the antique cars and the flying eagles, I wouldn't have minded if they were replaced with an over the top ride; they didn't and therefore I mind. Not taking any influence from Taft- It seems like when Taft left, there was a loss in KI magic that Cedar Fair is slowly starting to bring back. The train ride, for example, has since lost a huge chunk of its theming; thank godness they give the train the KD treatment. I felt like Paramount could have proven to be just as good if not better than Taft but they didn't, at least not in my eyes. PRO: Great job theming new attractions and areas. CON: Poor job maintaining said theming once it was put in place. - Installing new rides with themes that did not fit into the established theme of the area. 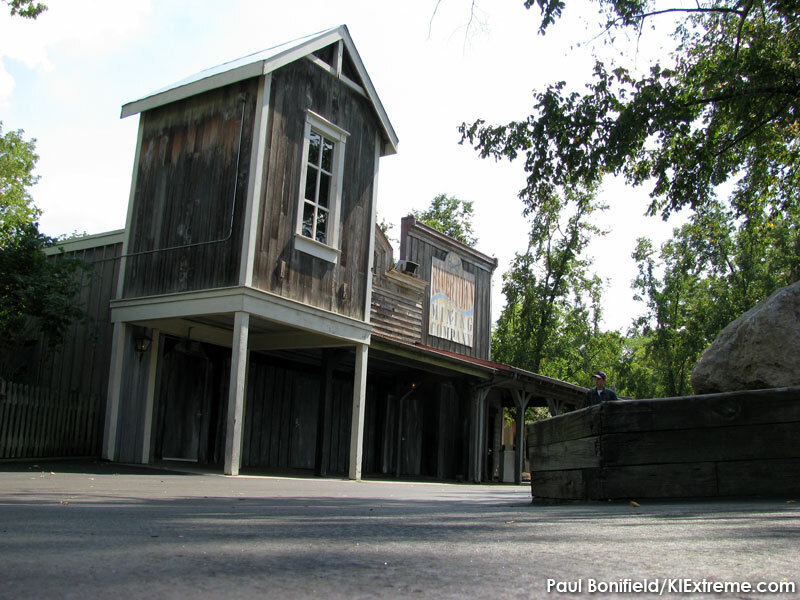 some examples are Top Gun in Adventure Village, Flight of Fear in Coney Mall and Tomb Raider in River Town. - Adding themed attractions without the budget to maintain theme elements in future years. - I feel like they primarily tried to go with more inexpensive coaster manufacturers such as Premier and Vecoma instead of investing in B&M or Intamin. As a result I can say that all of the coasters Paramount installed are pretty mediocre with the exception of Flight of Fear. The most notable coasters were either added before or after Paramount's ownership. Between the years of 1992 and 2006 KI built Top Gun, Flight of Fear, Face Off, Son of Beast, Italian Job, Rugrats Runaway Reptar and Scoobys Ghoster Coaster. Just to compare, during the same time period Cedar Point built Raptor, Mantis, Millennium Force, Wicked Twister, Woodstock Express and Top Thrill Dragster. Most of the ride additions were good. But it didn't seem that they had an overall plan in mind as to how each new addition "fit" into it's area. Action Zone was actually as close to congruent theming that Paramount had... in that there was no theming to fit in to. 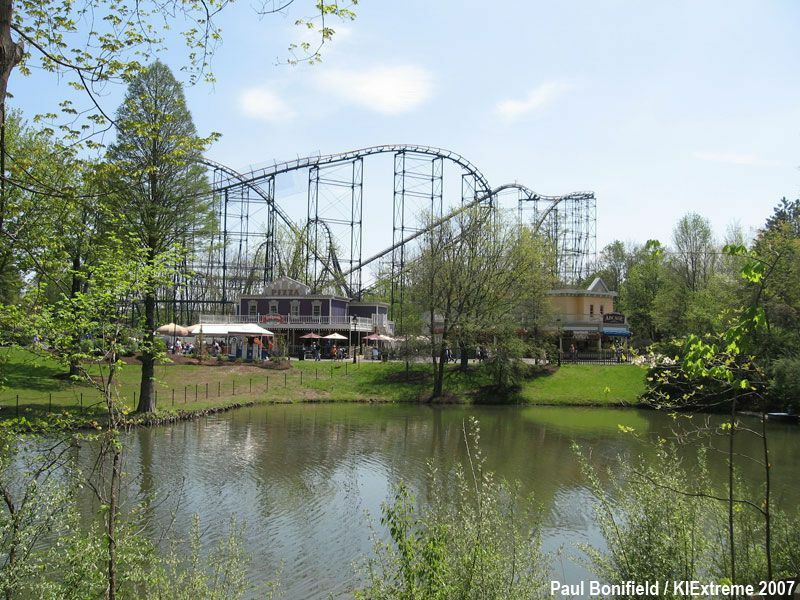 But lets be honest; other than being iconic to the skyline of the park- Son of Beast was a terrible coaster. A terrible ride experience in addition to a thoughtless approach to design. The roughest part of a wooden coaster are curves; for the most part that was all the coaster was. Curves are rough at 35 mph... SOB was 70+ (wasn't it?). 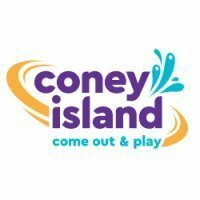 Being a movie production company with access to thousands of theming titles- they could have really had an iconic park but didn't seem like they wanted to dive into it. Top Gun was purchased by Taft's group and was originally going to be called Thunder Run or something along those lines. Paramount took the opportunity and changed it to be Top Gun, which was on one of their properties. Paramount bought a lot of cheaper rides that mostly panned out, however, most of them had pretty poor reliability and/or capacity. Let's be honest, Flight of Fear was a disaster and got a second life when they removed the OTSR. I know Kings Island under Paramount was hindered a bit by Cedar Fair limiting them from using certain designers, but I still think there were other reliable designers out there, but Paramount chose to rely too much on prototype rides. Son of Beast and Tomb Raider are both gone, Delirium still has problems each season (though less so than its early life). Sure we got Firehawk under CF, but that was only due to GL biting the dust. We've been lucky with our WindSeeker as well in that it's been nowhere near as problematic as, say, Knott's or CP's versions. Diamondback and Banshee have been great from a reliability standpoint, the Planet Snoopy additions have been solid, and Mystic Timbers should have minor problems in its first year and should be fine after that. Paramount did offer better staffing/training, theming, and got their act together better when it came to promotions and things to aid guests. I thought a lot of the benefits they gave to gold pass holders were done very well. Overall, they were kind of the grey area between how SIX and FUN ran their parks. What they got right was not being afraid to go big. 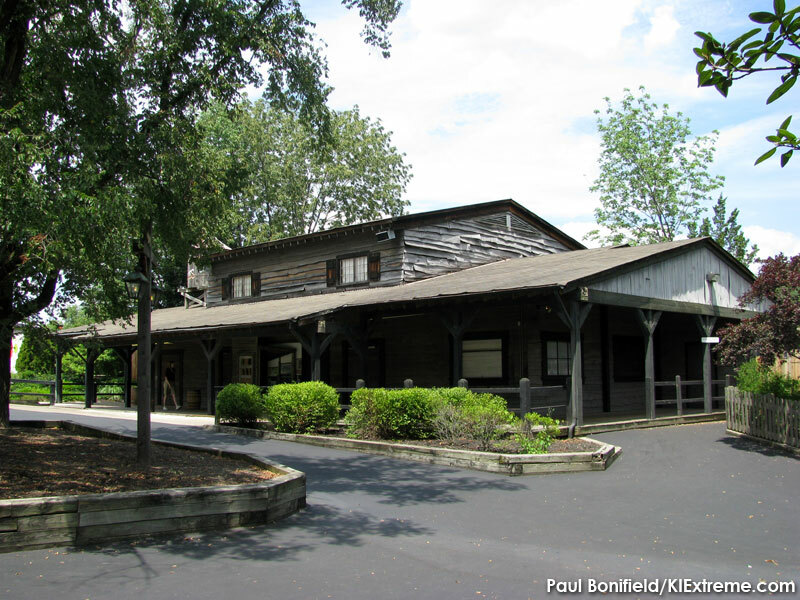 I think a good portion of Kings Island's success today is a residual effect of the grand Paramount's Kings Island days. You see guys, I told you I wasn't the only one who thought this was true! -Lack of keeping up with their products. -The ultimate demise and inadequate operation of Winterfest. Your right. Top Gun was purchased before Paramount took over. At the time Arrow Dynamics was the premier steel coaster manufacturer. Also around this time say around 1991 / 1994 B&M de-throned Arrow and Intamin began making a big name for themselves sometime later. But again Paramount never spent the capital to buy rides for KI from the notable coaster manufacturers (Arrow in the early 90s, then B&M then Intamin). As a kid I remember being soooo jealous of Cedar Point, the Busch Parks and Six Flags getting these awesome new Beemers and then KI builds an inverted boomerang.... or a ill fated wooden coaster that spent more time during its first season closed rather than open. I do understand that there may have been some "non compete" agreements that might have prevented KI from getting a B&M as well. Again I agree with you about FOF. In 1996 Flight of Fear was the talk of the theme park world. After the newness of the magnetic launch wore off we were left with the worlds most technologically advanced concussion machine. That is until the OTSR were replaced with lap bars. I would be curious to know why DB's seats are in such deplorable condition. I know it's not necessarily ride maintenance from a mechanical standpoint but it's what the public sees when waiting in que to load/unload the trains. I guess I would say to myself if the seats are in such bad condition, what else have they been neglecting....I dunno? ........thoughts! It is because they are not cleaned after use. It's a simple fix in my opinion. All they need is a bucket with wheels, soap and water with a couple long handled scrub brushes. At the end of each day once the last train with riders is dispatched. The next train ( once people disembark) gets sprayed and scrubbed down by two ride operators while being followed by the other 2 ride operators to Push the lapbars close so the train can depart, doing so that the train with riders can make it back to the station and the train that is now wet but cleaned can air dry. Every train will get its chance to be cleaned and dried because in order for the train to be put into storage for the night it must run the course to reach the transfer track. For a park that has difficulty fixing light bulbs, cleaning coaster trains after use probably won't happen. Unless there is a protein spill of course. I was waiting in line for Fury 325 last summer when all of a sudden we saw a few trains being dispatched with no riders. Once we got to the loading gates, we saw the crew spraying down the trains and subsequently releasing them for full circuit drying. All this due to several protein spills in one afternoon...yikes!! On topic of cleaning...was at Dollywood for "Christmas in the Smokies" last weekend getting on Wild Eagle. Once we got to the gate and all riders were seated and buckled, there was a brief wait and we couldn't figure out what the delay was since everyone on our side of the train was buckled in and ready to go. Well, during this brief wait, both ride ops on our side grabbed a spray bottle and immediately started wiping down the release gates ( the big metal steel gates that open when the train is released). At first, I thought,"really, seems like you guys could do this tonight after you close? ",because at that point, I was ready to ride. but... it turns out that on the opposite side of the platform, the ride ops over there were helping a handicapped person get seated which caused the brief delay. Then I said to myself, this is so AWESOME..taking advantage of a brief downtime to keep the area clean. Once again, Dollywood did not disappoint and this is the very reason that they are TOP NOTCH in customer service across the industry. Too bad ALL parks can't do this. Good point. I was actually going to buy an on-ride photo from Diamondback once, but in the picture there was an open seat, and the head rest on that thing was ratchet. My opinion: TR:TR was the best thing Paramount ever did. -Removing Phantom Theater despite it being still very popular among guest (including me) in 2002. Overall though it was a good time at the park under Paramount. I feel it's good to mention that many of the things people are saying are good are from the early Paramount days. Wow. That looks so different! Hard to imagine that that's the Diamondback entrance plaza now. Man, oh man. How I miss Swan Lake/old Rivertown. Was it just B&M that Paramount couldn't work with, or was Intamin included in that clause as well, given all the Intamins CP installed in the 2000s? Paramount put in Drop Zone and I know that was done by Intamin. That's not a coaster though. And Paramount did add some B&Ms. They added what is now known as Afterburn at Carowinds (formerly Top Gun) in 1999. I remember Swan Lake. I also remember this small stage in Rivertown- did Diamondback replace said stage (I also believe this was where Cut-Throat Cove was for FearFest?)? YEa Cut Throat Cove was where Diamondback's entry plaza is now. Though it did relocate to the Biergarten for a little bit beofre retiring. Just to clarify- my question regarding Intamin is in regards to CP's clause about CW and KI not being able to get a B&M at the time. Although I still think it is worth it all things considered, it's a shame how Cedar Fair removed Swan Lake for the Diamondback splashdown. 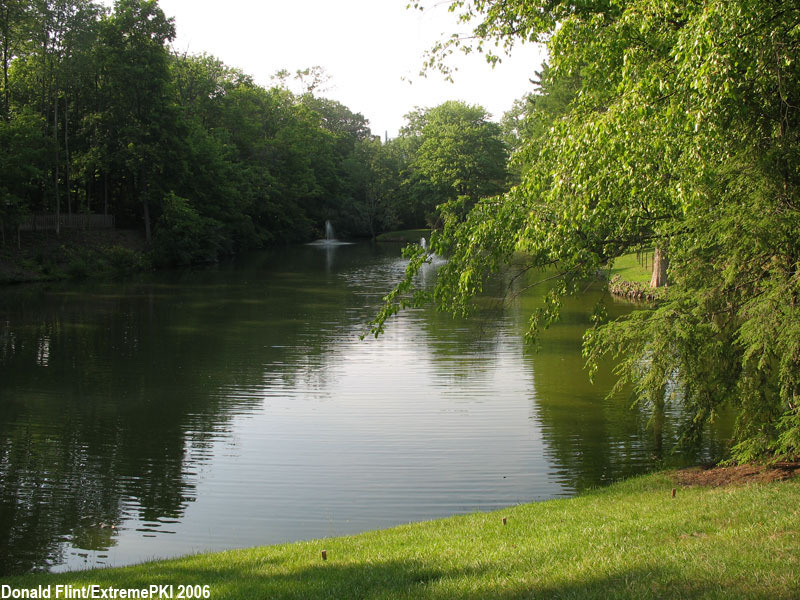 I don't see why the lake had to be drained and replaced with a small concrete pool. If they wanted a splashdown why not just drain the lake, build the coaster over the lake, and refill it. What a missed opportunity! The way I see it, I'm grateful Kings Island was the flagship Paramount park. 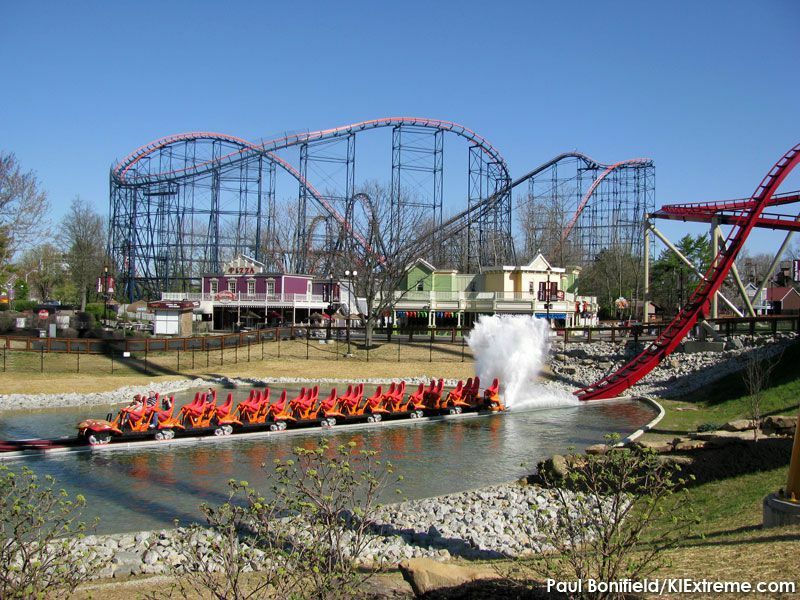 I feel like Kings Island was way ahead of its sister parks like Kings Dominion, Canada's Wonderland, Carowinds, and CGA because it received a lot more love than it deserved. It is nice however that the two most neglected Paramount parks- Carowinds and CGA and finally getting the love they so desperately deserved. I still don't understand why Carowinds and CGA didn't receive Italian Job Stunt Tract clones- does anyone know why?